A Public Page for fans of the life and writings of Dr F W Boreham has been established on the social media networking site Facebook. Articles are being shared, book reviews linked, discussions encouraged and pictures posted about FWB, 50 years after his death. 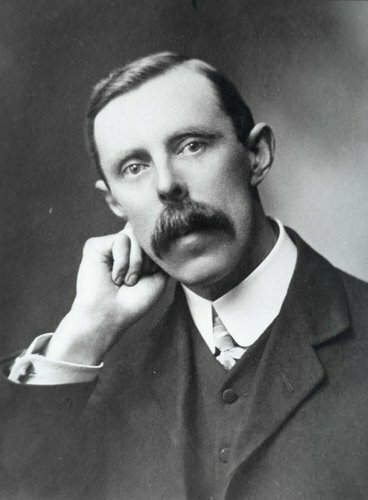 This new site gives the opportunity to see and share with others who have an interest in Frank William Boreham. Already over 80 people have become a part of this low key FWB Facebook community. The F W Boreham Page is one of the good reasons to become part of Facebook. 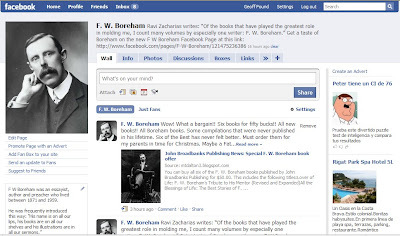 If F W Boreham were living today would he be on Facebook? I discuss this question in one of the first articles on the new site. Share this news with others interested in the life and ministry of FWB. Here is the link to the F W Boreham Facebook Page. Image: F W Boreham Public Page on Facebook. F W Boreham recorded some radio talks on Australia’s ABC station in the 1940s and 1950s. I’m grateful to Andrew Corbett who has made them available and posted four talks (sound files) on his web site, Finding Truth Matters. Andrew, who lives in FWB’s old Australian state of Tasmania, has written a fine article entitled, ‘F W Boreham: The Greatest Essayist of All Time.’ You will find the link on the left margin of Andrew’s site or you can click at this point. The four devotional talks by F W Boreham are at the bottom of that article. A Missionary address given at a Baptist Union of Victoria Assembly is in the BUV Archives, as is a fairly indistinct recording that was taken off a record disc, on the topic of the Trinity. FWB sounds rather old on these four devotional talks and he was probably more vigorous when younger and speaking to the Hobart Tabernacle congregation. On these four talks he adopts a more conversational style. Boreham’s voice has a mixture of a Kentish accent that has been tempered by living in cosmopolitan London, a dozen years in NZ and the balance of his life based in Australia. That was the question. That is always the question. 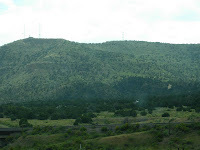 My friend and I had been spinning along in the car, the towering mountain and the shining harbour behind us, whilst each bend in the road presented us with a fresh unfolding of the ceaseless panorama of woodland, pasture, and stream. We were bound for nowhere, and so far as we could see the road led there. We were out for the pure sake of being out. All at once a sense of chilliness crept over us, and we were reminded that even the wealthiest days become bankrupt at last. Should we turn round and go home? There was only one objection. Right ahead of us lay a long range of hills. They had attracted our attention a few hours earlier as we sat under a big tree by the side of the road enjoying an al-fresco lunch. During the afternoon their massive forms had crept nearer and nearer, as the car had sped swiftly towards them. They captivated our fancy and lured us on. There was something taunting and challenging about them. That is how history and geography—and everything else—came to be. The first man, toiling amidst his weedy pastures, earned his bread in the sweat of his brow. But often, in the cool of the evening, he sat outside his primitive dwelling and pointed away to the hill tops that here and there broke the skyline. 'I wonder,' he said a hundred times to his companion, 'I wonder what is on the other side of the hill!' It never fell to his happy lot to sweep with delighted eye the valleys that stretched out beyond those ranges; but his sons and his grandsons conquered those tantalizing heights. They went out, north, south, east, and west; climbed one range and caught sight of another; were lured on and on—always by the old, old question; wandered beyond reach of each other; lost touch with the old home; settled here and settled there; and so your tribes, your races, your nations, and your empires came to be. It was the other side of the hill that did it. Why the 'wild surmise'? Simply because they had found an ocean without looking for it! They were not searching for the Pacific; they were simply trying to find out what was on the other side of the hill! That was all. Yes, that was all; and yet, after all, it is a fine thing to know what is on the other side of the hill. Who can read the fiery theological controversies of days gone by without wishing that each of the angry disputants had been able to peep over the brow of the ridge? Think of the language with which Luther and Calvin assailed each other! Think even of the correspondence of Wesley and Toplady. Wesley, the greatest evangelical force that England has ever known, wrote of the author of `Rock of Ages,' `Mr. Augustus Toplady I know well; but I do not fight with chimney-sweeps. He is too dirty a writer for me to meddle with; I should only foul my fingers.' Toplady was quite capable of repaying the founder of Methodism in his own coin. Wesley, he declared, was a hatcher of blasphemies; his forehead was impervious to a blush; he had perpetrated upon the public a known, a wilful, and a palpable lie! But it is too bad of me to drag these amenities of eighteenth-century controversy from the dust that has so long covered them. Let me bury them again at once; and let us remember Wesley only as the greatest spiritual force in the making of modern England, and let us remember Toplady only as the author of our favourite hymn. For, after all, what do these angry sentences prove? They only prove that, for a little season, neither Wesley nor Toplady were able to see what was on the other side of the hill. I never read a newspaper controversy, or listen to a heated debate, without feeling that. It is so obvious that each of the disputants is standing on his own side of the hill, shouting at his opponent over the ridge that separates them. `The bush consists principally of wattle!' cries A., looking around him at the swaying tassels of gold. `I tell you that the bush consists principally of gum!' replies B., as he hears the flapping of the great strips of bark on every side. 'It is wattle!' cries A. `It is gum!' cries B. `You're distorting the facts!' shrieks A. `You are telling lies!' returns B. And so the quarrel goes on; both A. and B. getting hotter and angrier as it proceeds. But anybody who stands on the ridge, looking down into both valleys, can see that both are right. On A. 's side the soil and the general conditions favour the growth of the wattle, and the wattle undoubtedly predominates. Just over the hill, the eucalyptus is in its element, and, as a consequence, the blue-gum reigns without a rival there. If only A. and B. could each have taken a peep over the hilltop! If only Calvin could have seen things as they presented themselves to the eye of Luther; and if only Luther could have looked at the universe from Calvin's standpoint! If only Wesley could have taken Toplady by the arm, and they could have walked together—first to the one side of the hill and then to the other! If only all our controversialists could be convinced of the very obvious truth that a peak is the meeting-place of two separate valleys! But alas, alas; it is very difficult. So many people seem to suppose that a hilltop crowns one valley and one valley only. So few are willing to see what grows on the other side of the hill. And yet, for the matter of that, every man knows what is on the other side of the hill. Immensity is on the other side of the hill. Infinity is on the other side of the hill. From my doorstep to the hilltop is a matter of a mile or two at the most; but who can measure in miles the land that lies on the other side of the hill? Between me and the hills lie a cluster of farms; but all the continents and oceans lie over the ranges—on the other side of the hill. Therein lies the consecration and the glory of the Church. There's no sense in going further—it’s the edge of cultivation! 'Go,' said the Master. `Go ye into all the world.' In that tremendous 'Go,' the Church has caught a glimpse of the other side of the hill, and has herself been saved from narrowness by the discovery. Yes, immensity and infinity are on the other side of the hill. Immensity and Infinity—and Eternity. That is why the pilgrims of the ages have been struggling with bleeding feet up those precipitous slopes. They hoped that, from the summit, they might catch one satisfying glimpse of the Beyond. Sages and savages alike have gazed with awe at the hilltops, wondering what lay on the other side. No tribe or people has ever been discovered but in some tent or wigwam or kraal there dwelt some priest or fakir or medicine-man who guessed and muttered of the things on the other side of the hill. Oh, the witchery and the mystery of the other side of the hill! Oh, the lure and the fascination of the other side of the hill! There is, I say, a deeper significance in that South American statue than its constructors imagined. For Jesus stands on the hilltop. He sees what is on our side of the hill, and He sees what is on the other. And, since He knows, I need no fakir, no guesser, no medicine-man. He has brought life and immortality to light through the gospel. And there He stands! And so long as He commands that eminence, there is no terror for me on either side of the hill. F W Boreham, ‘The Other Side of the Hill’, The Other Side of the Hill (London: Charles H Kelly, 1917), 39-47. I have a special fondness for explosive people. I can never persuade myself that dynamite got into the world by accident. I intolerantly scout the theory that the devil built all the volcanoes, and that his minions feed their furious fires. I have admired an indescribable grandeur in the hurricane. I have felt the cyclone to be splendid, and the tornado to be next door to sublimity. Even the earthquake has a glory of its own. And how a thunderstorm clears the air! How deliciously sweet my garden smells when the riven clouds have passed, and the glittering drops are still clinging like pendant gems to the drooping petals and the bright green leaves! And, in the same way, I have discovered something terribly sublime in those stormy elements that sweep the realm within. There was a time when my eyes were closed to this side of the glory of God's world. I used to think it a dreadful thing for Paul to be cross with Barnabas. I thought it shocking if Barnabas spoke sharply to Paul. For Barnabas was `a good man and full of the Holy Ghost.' And Paul was `a good man and full of the Holy Ghost.' And I thought that so lovely and tranquil a little world had no room for dynamite. Till, one day, a thing happened that made me feel as though a volcano had burst into eruption at my feet! I was thunderstruck! The circumstances are briefly told. Paul and Barnabas had just completed one adventurous, triumphant, and historic campaign together. Together they had crossed the tumbling seas in crazy little vessels that would scarcely now be permitted to cruise about a river. Together they had trudged, singing as they went, along the lonely forest trail through the lowlands of Pamphylia. Together they had climbed the great pass over the mountains of Pisidia. Together they had felt the exhilaration of the heights as they surveyed, shading their eyes with their hands, the lands that they had come to conquer. Together, at the risk of their lives, they had forded streams in full tumultuous flood; together they had known hunger and thirst; together they had shared unspeakable hardships; together they had faced the most terrible privations. Together they had been deified one day, and together they had been stoned the next. Together they had made known the love of Christ in the great capitals; together they had rejoiced over their converts; and then, together, they had made that never-to-be-forgotten return journey. I have often tried to imagine their emotions, as, on the homeward way, they came in sight of one city after another that they had visited in coming. In coming, those cities were heathen capitals and nothing more. In returning, there were churches there and fond familiar faces! And what meetings those must have been in each city when the members again welcomed Paul and Barnabas; when the two scarred heroes told the thrilling tale of their experiences elsewhere; and when, in each church, ministers and officers were appointed! And, leaving a chain of thoroughly organized churches behind them across the land, as a ship leaves her foaming wake across the waters, the two valiant and dauntless companions returned home. How all this had welded these two noble souls together! They are knit, each to each, like the souls of David and Jonathan. And now a second campaign is suggested. Barnabas proposes that they should take with them Mark. Mark, who was the nephew of Barnabas had started with them on their former journey; but, at the first brush of persecution, he had hastily scampered home. Paul instantly vetoes the proposal. He will not hear of it. He will not have a coward at any price. His soul loathes a traitor. Barnabas insists, but Paul remains adamant. `And the contention was so sharp between them that they departed asunder the one from the other,' and, probably, never met again. 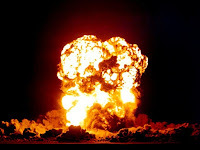 If I had not been actually present and witnessed this amazing explosion with my own eyes, I fancy my faith would have staggered. As it is, the surprising spectacle only taught me that God has left room for dynamite in a world like this; and, much as I admired both Paul and Barnabas before the outburst, I loved them still more when the storm was overpast. I have said that I saw this astonishing outburst with my own eyes. That is so, or at least so I fancied. For it seemed to me that I was honoured with a seat on a committee of which both Paul and Barnabas were valued and revered members. We all loved them, and treasured every gracious word that fell from their lips. For `Barnabas was a good man and full of the Holy Ghost.' And 'Paul was a good man and full of the Holy Ghost.' Now Mark had applied to the committee for engagement as a missionary. And Barnabas rose to move his appointment. I shall never forget the charm and grace with which he did it. I could see at a glance that the good man was speaking under deep feeling. His voice reflected his strong emotion. He reminded us that Mark was his relative, and he felt a certain heavy responsibility for his nephew's spiritual well-being. He trembled, he said, lest he should be condemned as one who risked his life for the heathen over the seas, but who displayed no serious solicitude concerning his own kith and kin. He had wept in secret over his young kinsman's former treachery. But it had made him the more eager to win his soul in spite of everything. He was alarmed lest the rejection of his relative should lead to his utter humiliation, total exclusion, and final loss. He admitted with shame and grief all that could be alleged against him. He had been weighed in the balances and found wanting. He had turned his back in the hour of peril. But what of that? Had we not all our faults and failures? I remember that, as he said this, Barnabas glanced round the council-table, and looked inquiringly into each face. There was moisture in his own bright eyes, and each man hung his head beneath that searching glance. And then, he went on, surely there was something admirable in Mark's original venture. He had nothing to gain by going. It was his enthusiasm for the cause of Christ that prompted him to go. It proved that his heart was in the right place. And the very fact that he was anxious to set out again, with a full knowledge of the perils before him, proved indisputably that he had sincerely repented of his earlier unfaithfulness, and was eager for an opportunity of redeeming his name from contempt. How could we ourselves hope for forgiveness unless we were prepared to show mercy in a case like this? Once more those searchlights swept the faces round the table. And then, with wonderful tenderness, Barnabas reminded us of the bruised reed that must not be broken and of the smoking flax that must not be quenched. And, in the name of Him who, after His resurrection, found a special place for Peter, the disciple who had thrice denied his Lord, Barnabas implored us to favour his nephew's application. There was a hush in the room when the gracious speech was finished. We all felt that Barnabas was a good man and full of the Holy Ghost. Then Paul rose. One could see at a glance that his whole soul rebelled against having to oppose the partner of so many providential escapes, the comrade of so many gallant fights. The affection of these two for each other was very beautiful. Paul admitted frankly that he had been deeply touched by the gracious words that had fallen from the lips of Barnabas. His heart leaped up to greet every one of those appeals. Each argument met with its echo and response in every fibre of his being. For old friendship's sake he would dearly like to accede to the request of Barnabas. Was it not through the influence of Barnabas, and in face of strong opposition, that he himself was admitted to the sacred service? And because Mark was his old friend's nephew he would especially wish to entertain the proposal. But we were gathered together, he reminded us, in the sacred interests of the kingdom of Christ. And for the sake of the honour of that kingdom we must be prepared to set aside considerations of friendship, and even to ignore the tender claims of kinship. The friendship of Barnabas was one of earth's most precious treasures; but he could not allow even that to influence him in a matter in which he felt that the integrity of the cause of Christ was at stake. The relatives of Barnabas were as dear to him as his own kith and kin; but there were higher considerations than domestic considerations. Mark had once—perhaps twice—proved himself unequal to the claims of this perilous undertaking. He might render excellent and valuable service in some other capacity. But for this particular enterprise, which required, as well as a warm heart, a cool head and a steady nerve, Mark was clearly unfitted. He became terror-stricken in the hour of danger. They could not afford to run such risks. A defection in their own party gave the enemy cause to blaspheme. It exposed them to ridicule and contempt. The heathen cried out that these men were prepared to follow Christ so long as Christ never went near a cross. The Jews, who had themselves suffered for their faith, laughed at a new doctrine from which its very teachers might be scared and intimidated. And the young converts would find it immensely more difficult to endure persecution for the gospel's sake if they beheld one of the missionaries turn his back in the hour of peril. He had long ago forgiven Mark, he said, for his former failure. Indeed, he scarcely recognized any need for forgiveness. He felt sorry for his young friend at the time, and he felt sorry for him still. Mark was a gentle spirit, not made for riots and tumults; and, in the shock of opposition, he was easily frightened. His love for Christ, and his zeal for service, were very admirable; and they all loved him for his simplicity and sincerity and enthusiasm. But, knowing his peculiar frailty, they must not expose either him or the cause to needless risk. The welfare of Mark, and the reputation of the Cross, were very dear to him; and he would on no account whatever agree to submit the delicate soul of Mark to a strain that it had already proved itself unable to bear, or the gospel to an unnecessary risk of being brought into disfavour and contempt. He implored the committee to deal wisely and considerately with the subtle and delicate and complex character of his young friend, and to prize above everything else the honour of the gospel. Personally he was quite determined that it would be a wicked and unjust and unkind thing to expose the soul of Mark to such imminent peril, and the Cross of Christ to such grave risk of further scandal. He would on no account take Mark. The speech was so tempered with tenderness, as well as with firmness and wisdom, that it created a profound impression. We all felt that Paul was a good man and full of the Holy Ghost. Neither would yield. How could they? Each had heard a voice that was higher and more imperative than the voice of sentiment or of friendship. It is ridiculous to say that they should have `made it up' for old sake's sake, or for the gospel's sake, or for any other sake. Barnabas believed, in the very soul of him, that it would be wrong to leave Mark behind. And Paul believed, in the very soul of him, that it would be wrong to take Mark with them. You cannot bridge a gulf like that. Each tried to convince the other. The contention became sharp but futile. And they parted. And I, for one, honour them. They could not, as `good men and full of the Holy Ghost,' have done anything else. I do not pretend to understand why God has made room in the world for earthquakes and volcanoes. I see them tear up the valleys and hurl down the mountains; and I stand bewildered and astonished. But there they are! I do not pretend to understand these other explosive forces. But there they are! And I, for one, love both Paul and Barnabas the more that they will neither of them sacrifice, even for friendship's sweet sake, the interests of the cause of Christ. In my New Zealand days I knew two men, almost aged. I have told the story in detail in Mushrooms on the Moor. These two men had been bosom friends. Time after time, year after year, they had walked up to the house of God in company. In the days of grey hairs they came to differ on important religious questions, and could no longer conscientiously worship beneath the same roof. They met; they tried to discuss the debatable doctrine; but their hearts were too full. Side by side they walked for miles along lonely roads on a clear, frosty, moonlight night, in the hope that presently a discussion would be possible. I walked in reverent silence some distance ahead of them. But speech never came. Grief had completely paralysed the vocal powers, and the eyes were streaming with another eloquence. They wrung each other's hands at length, and parted without even a `Good-night.' They still differ; they still occasionally meet; they still love. They even admire each other for being willing to sacrifice old fellowship for conscience sake. There is something here with which the more flippant advocates of church union do not reckon. Paul and Barnabas are good men, both of them, and full of the Holy Ghost. But they cannot agree. Face to face, the contention becomes very sharp. They wisely part. As I say, I do not pretend to understand why God left so many explosive forces lying about His world; but there they are! It all turned out wonderfully well, as it was bound to do. Barnabas, whatever became of him, made a hero of Mark. He became perfectly lion-hearted. `Bring Mark with thee,' wrote Paul to Timothy, when he himself was awaiting his martyr-death at Rome. 'Bring Mark with thee, for he is profitable to me for my ministry.' And I like to think that when Peter felt that the time had come to put on permanent record the holy memories of earlier Galilean days, he employed Mark to pen the precious pamphlet for him. Peter and Mark understood each other. And as they worked together on that second `gospel,' they had many a tearful talk of the way in which, long before, they had each played the coward's part, and had each been greatly forgiven and graciously restored. To those of us who look up to Paul and Barnabas as to a terrific height above us, it is splendid to know that there is room for Peter and for Mark in the heart that loves and in the service that ennobles. F W Boreham, ‘The Powder Magazine’, The Other Side of the Hill (London: Charles H Kelly, 1917), 253-264. When I was a small boy in my Kentish home, I was occasionally missing—even at meal-times. As the years wore on, the alarm created by these mysterious disappearances of mine gradually subsided, not by reason of any dwindling value or importance attached to my person, but simply because a very shrewd conjecture could be formed as to my whereabouts. For at the foot of our garden, separated from it by a high bank, which was itself a romantic wilderness of blackberries, ran the railway. And just beside the railway line, not more than a hundred yards from the bottom of the garden, was the signal-box. Few things delighted me more than to spend an hour in that old signal-box. It was close to the mouth of the tunnel. I loved to hear the bell go ring-a-ting-ting when the train entered the tunnel on the far side, and to watch for its emergence on our side. It seemed to me positively uncanny that the signalman could tell by all these clanging tokens just where all the trains were. I liked to see him swing the great levers backwards and forwards, pulling the signals up and down, and at night-time causing the green and red lights to shine from the tall signal-posts. As I sat beside his great, roaring fire on winter evenings, and saw him stop the trains or let them pass, just as he pleased, I thought he must surely be one of the most important men in the country. I could scarcely imagine that the Prime Minister had greater authority or responsibility. And I remember, as clearly as though it were yesterday, that I used to sit on the stool beside that fire—face in hands and elbows on knees—wondering if I might hope, one great day, to attain to the glory of being a signalman. And, surely enough, I have. For I have come to see, as the days have gone by, that we humans are expert and inveterate signalmen. We have a perfect genius for concocting mysterious codes; we revel in flashing out cryptic heliograms; we glory in receiving occult messages. We even communicate in this abstruse and recondite fashion with our own selves. A man will twist a piece of string round his finger, or tie a knot in the corner of his pocket-handkerchief, or stick a scrap of stamp-paper on the face of his watch, to remind him of something that has nothing whatever to do with string or handkerchief or stamp-paper. It is his secret code, and in the terms of that code this inveterate signalman is signalling to himself, that is all! Moreover, we not only signal to ourselves, but we are fascinated by the spectacle of other people signalling to themselves. A novel becomes invested with a new interest when its plot suddenly turns upon the weird phenomena of a witch's cavern or the mysterious ritual of a gipsy camp. By means of her viper, her owl, her toad, her cauldron, her tripod, her herbs, and all the rest of it, the withered crone in the dimly lighted cave is signaling to herself from morning to night; by means of the crossed sticks where the roads fork the gipsies leave tokens for themselves and each other. Many a man will wear a charm hanging round his neck, or suspended to his watch-chain, of which nobody knows the significance but himself. Luther went down to his grave without revealing even to his wife the meaning of the five mystic initials that he had carved over the portal of his house. They are, he explained, the initials of five German words; but what those words were he alone knew. The signals stand to this day over the portal; the code was locked up in the great reformer's breast, and, deposited there, it descended with him to his tomb. Henrik Ibsen, too, the great Norwegian dramatist, kept on his writing-table a small ivory tray containing a number of grotesque figures, a wooden bear, a tiny devil, two or three cats—one of them playing a fiddle—and some rabbits. `I never write a single line of any of any dramas,' Ibsen used to say, `without having that tray and its occupants before me on my table. I could not write without them. But why I use them and how, this is my own secret.' Here was a great and brilliant thinker happy in being able to flash covert messages to himself by a code which no one but himself ever knew! I instance these—the witch's cavern, the gipsy's ritual, the reformer's portal, and the dramatist's tray—to show that our passion for signalling is so ingrained and deep-seated that, if we cannot satisfy it in cryptic communication with others, we atone for the deficiency by signalling to ourselves. After all, there is but one really universal language. It was spoken in the world's first morning, and people will still be speaking it when they are startled by the shocks of doom. It was the language of the Stone Age, and it will be the language of the golden Age. It is spoken all the world over by people of all kinds, classes, colours, and conditions; and if either Mars or the moon is really inhabited, it is spoken there too. The little child speaks it before he is able to lisp one single word of our clumsier dictionary speech; and the aged spear it long after the palsied lip has lost its utterance. It is equally intelligible to the English merchant on the London market, to the Indian trapper in the Western forests, to the Chinese mandarin in the far interior of Asia, to the South Sea Islander basking in the rays of an equatorial sun, and to the Eskimo in his frozen hut amidst the blinding whiteness of the icy North. It is known even to the beasts of the field and the birds of the air; they understand it, and sometimes even speak it. The universal language is the language of gesture. The shrug of the shoulders; the flash of the eye; the knitting of the brows; the curling of the lip; the stamping of the foot; the clenching of the fist; the nodding of the head; the pointing of the hand,—here is a language which is known to everyone. It has no alphabet, no grammar, and no syntax; but the simplest can understand it. Indeed, the simplest understand it best. The savage is a master of gesture. He speaks with every nerve and muscle. And the little child is no less eloquent. Playing with her doll on the floor behind my chair is a small scrap of humanity who has as yet uttered no word that a lexicographer would recognize. And yet it would be absurd to say that she has not spoken. Her pushings and pullings, her beckonings and pointings, her smilings and poutings, are as expressive as anything in any of your vocabularies. She has found a speech for which the builders of Babel sighed in vain—a speech that can be understood by men and women of every nation under heaven. It is the language of signals. We are living in a universe that is constantly trying to talk. It does not understand any of your artificial or manufactured languages—your Hebrew or Greek or Latin; your English or German or French—but it understands the universal language, the language of gestures, the language of signals. ‘The air,’ says Emerson, ‘is full of sounds, the sky of tokens; the ground is all memoranda and signatures; and every object is covered over with hints which speak to the intelligent.' The stars above my head are signalling; the astronomer masters the code and reads the secrets of the universe. The stones that I tread beneath my feet are signaling; the geologist unravels the code and interprets the romance of ages. All Nature is one intricate system of signals as any naturalist will tell you. Let Richard Jefferies speak for them all. In discussing the birds that shelter in the ivy under his gable, he says that often a robin or a wren will pounce upon a caterpillar whilst the grub is still concealed among the grass. How is it done? It is all a matter of signals. `The bird's eyes, ever on the watch for food, learn to detect the slightest indication of its presence. Slugs, caterpillars, and such creatures, in moving among the grass, cause a slight agitation of the grass blades; they lift up a leaf by crawling under it, or depress it with their weight by getting on it. This enables the bird to detect their presence, even when quite hidden by the herbage, experience having taught it that, when grass is moved by the wind, broad patches sway simultaneously, whilst, when an insect or caterpillar is the agent, only a single leaf or blade is stirred.' The birds learn the code and readily interpret the signals. Those who live near to Nature soon acquire the same habit. The poetry of the countryside abounds with rhymes and couplets that are, after all, only expositions of Nature’s signals. You may sow French beans if you be willing. What is this but the interpretation of the code? The whispering elm leaves are the farmer's signal-flags. The universe, like the baby on my study floor, is always pathetically trying to talk to me; and the pity of it is that I am so slow to understand. Joseph pocketed their Iron Crown, an implement, as was sagaciously observed, in size and commercial value little differing from a horseshoe? It is in and through symbols that man, consciously or unconsciously, lives, works, and has his being; those ages, moreover, are accounted the noblest which can the best recognize symbolic worth and prize it the highest. For is not a symbol ever, to him who has eyes for it, some dimmer or clearer revelation of the Godlike?' When, that is to say, man has something really great to say he says it by some mute sign or silent symbol. Similarly, when God has something to say to the Jew alone, he may perhaps cause His messenger to say it in the Hebrew tongue; but when He has something to say to all people everywhere, He always speaks the universal language, the language of gesture and symbol and sign. He speaks to the universal heart by means of the Ark, the Scapegoat, the Passover, the Mercy Seat, the Serpent in the Wilderness, the Cities of Refuge. Such signs need no translation; they speak to people of every clime and time. In the New Testament the same principle holds true. When God has something really vital to say to people, God says it in a language that requires no translation or interpretation. God says it in a way that all people can comprehend. 'The veil of the temple was torn in two from the top to the bottom.' All people everywhere can see the awful and profound significance of such a signal. A person may be unable to grasp the doctrine of the Atonement; but where is the heart that does not respond to the Vision of the Cross? We are inveterate signalmen. We begin to make signals as soon as we crawl from our cradles; we are still making them when tottering down to our graves. `It may be, master,' said Richard Bannatyne, John Knox's faithful serving-man, 'it may be that you will still he able to recognize my voice after you have become oblivious to every other sight and sound. When you are apparently unconscious, I shall bend over you and ask if you have still the hope of glory. Will you promise if you are able to give me some signal, that you will do so? The old reformer made the promise, and, a few days later, turned into his room to die. He waited for his exit through life’s portal, death. He raised a clay-cold finger and pointed to the sky. To give the struggling spirit a sweet enfranchisement. The cold, stark, stiffening finger still pointing up to heaven. It is a great thing when the signalman's last signals are as unequivocal as that. F W Boreham, ‘The Signal-Box’, The Uttermost Star (London: The Epworth Press, 1919), 9-18. At the Melbourne Art Gallery this afternoon my attention was captivated and monopolized by a noble painting by the late John Pettie, R.A. It is entitled Challenged, and once adorned the walls of the Royal Academy in London. A gay young aristocrat has been called from his sumptuous couch in the early morning by a challenge to a duel. There he stands, attired in his blue dressing gown, holding the momentous document in his hand. His old serving-man, who has delivered the missive to his master, is vanishing through the distant door; a sword reposes suggestively upon a chair. But the whole artistry of the picture is concentrated in the face. It is the face of a thoughtless, shallow, self-indulgent young man-about-town suddenly startled to gravity and something like nobleness. By means of that face, the artist has skilfully portrayed the fact that life becomes smitten with sudden grandeur the moment it is challenged by stupendous issues. Life and death confront this young lord, and he becomes a new man as he realizes their stately significance. No man amounts to much until all his faculties have been challenged. There must come a moment when a trumpet-blast, a pistol-shot, a bugle-call stirs all his pulses. And, this being so, life takes good care that, sooner or later, we shall each find ourselves dared by some tremendous situation. Therein lies the secret of that thirst for adventure which is the hall-mark of humanity. I was listening last night to Dr. Adrian Carter, the principal of Clarendon House. Dear old Dr. Carter-'Magna Charta' as the boys irreverently call him! I would not miss the old gentleman's Speech Day oration for a king's ransom. His very appearance is a sight for sore eyes. He looks for all the world like a reincarnation of Mr. Pickwick. Everything about him—his chubby face, his prominent glasses, his expansive waistcoat, and even his trick of keeping his left hand, when speaking in public, under his coat—tails and flicking those coat-tails to emphasize his crucial points—intensifies the similarity to Mr. Pickwick. In his Speech Day deliverances, Dr. Carter lays down the law in such a way that every sentence seems a crystallization of the ultimate wisdom. On the theme with which he is dealing, there appears to be nothing more to be said. And yet, on the way home, you often catch yourself wondering. This year, in his Speech Day address, the little old gentleman deplored the decay, in the rising generation, of the spirit of adventure. The world has been knocked into shape, he said, by people who scorned comfort and courted hardship. Anybody, he declared, flicking his coat-tails with special energy, anybody can follow the line of least resistance; anybody can settle down to the first job that comes; anybody can hug the coast. `I trust,' he impressively observed in conclusion, `I trust that the boys of Clarendon House will seek life's distant and more difficult tasks and thus maintain the most splendid traditions of the glorious past! 'He resumed his seat, I need scarcely say, amidst a storm of tumultuous applause. This is excellent—as far as it goes; the only trouble is that it does not carry us very far. For, to begin with, it is evident that it is some little time since the doctor himself was a boy. He has forgotten one or two things pertaining to his boyhood. For, in point of fact, no boy needs to have revived within him the spirit of adventure. It pulses in his blood all the time. No boy could have presented to the world a less adventurous appearance than did I. I do not recall one solitary occasion on which I became involved in censure through any daring escapade such as those of which the writers of school-boy stories love to tell. To my parents and teachers my life must have appeared utterly placid, utterly tranquil, utterly commonplace. Yet, looking back, I can see that, all unsuspected, the spirit of adventure was throbbing within me. The worst crime ever laid to my charge was the crime of being absent-minded. The headmaster stigmatized me as 'an incorrigible wool-gatherer.' I distinctly remember a certain Examination Day. We had been told overnight that the Inspector was coming. We were to arrive at school next morning in our best Sunday clothes, with clean collar, brightly polished boots and finger-nails destitute of any funereal suggestion. I was floored, for the question had completely eluded me. 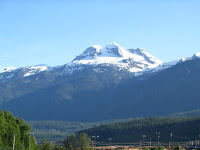 His previous inquiry concerning Western Canada had despatched my mind on a personally-conducted tour to the Rocky Mountains, and I was in the midst of a titanic struggle with a grizzly bear at the very moment at which he asked his further question relating to Java. Reviewing my boyhood, I can see that this sort of thing happened frequently. My unimaginative teachers obstinately insisted on asking their most ridiculous questions concerning Latin conjugations and recurring decimals at exciting moments when I was engaged in snatching a beautiful girl from the horns of an angry bull, or pursuing, single-handed, a powerful tribe of Iroquois Indians, or delivering a charming princess from a blazing palace or winning the Victoria Cross under circumstances of unprecedented gallantry. The doctor was anxious, he said, to awaken in his boys the spirit of adventure. Has it never occurred to him, I wonder, that, in itself, the spirit of adventure is a pitifully poor thing? Two of the best books ever written—books that all the boys at Clarendon House will read before they are many days older—were written to show that, in itself, the spirit of adventure is worthless and even dangerous. It only becomes sublime when consecrated by a noble aim. In the early pages of Hereward the Wake, Kingsley describes his hero as he first becomes conscious of his insatiable craving for adventure. Longing for a hectic and perilous career, he looks this way and that way in search of some opportunity of performing desperate and doughty deeds. He wearies of the humdrum of home. Out in the wide, wide world, beyond the borders of the too-familiar Bruneswald, he fancies that every hill and valley is swarming with dragons, giants, dwarfs, ogres, satyrs and similar weird and fantastic creatures. Where shall he go? To Brittany where, in the depths of the forest, beautiful fairies may be seen bathing in the fountains, and possibly be won and wedded by a sufficiently bold and dexterous knight? To Ireland, and marry some beautiful princess with gray eyes and raven locks and saffron smock and enormous bracelets made from the gold of her own native hills? No, he will go to the Orkneys and join Bruce and Ranald and the Vikings of the northern seas! Or he will go up the Baltic and fight the Letts upon the water and slay the bisons on the land! Or he will go South; see the magicians of Cordova and Seville; beard the Mussulman outside his mosque and perhaps bring home an Emir's daughter! Or he will go to the East, join the Varanger Guard, and, after being thrown to the lion for carrying off a fair Greek lady, will tear out the monster's tongue with his own hands and show the Orient what an Englishman is made of! At this stage, it will be observed, Hereward is seeking adventure for its own sake. The purpose of the exploit may be admirable or execrable: it does not matter. It may leave him a hero or a cut-throat: he does not care. Happily, Hereward discovered, comparatively early in his career, that a deed can only derive its lustre from its motive and its aim. No deed, however audacious, is worth while unless it relieves the oppressed, raises the fallen, and makes the world a better place for everybody. This discovery represents the spiritual development of Kingsley's massive hero; and it is to trace this subtle evolution in Hereward's character that Kingsley wrote the book. Pretty much the same may be said of Don Quixote. Cervantes saw to his sorrow that chivalry was running wild. The stories told by the men who were returning from the wars were inflaming the imagination of the youth of Castile to a positively dangerous degree. Hot-headed young enthusiasts were swept off their feet by an insatiable desire to cover themselves with glory. They would fight something or somebody, whether that something or somebody needed to be fought or not. Cervantes wrote his book to show that it is better to stay at home breaking stones by the roadside than to rush forth and hazard one's life in tilting at windmills. It is not enough, therefore, to urge boys to develop the spirit of adventure. The spirit of adventure, undirected and unconsecrated, made Hereward the Wake a ruffian, made Don Quixote a clown; and has made many a boy a criminal. Dr. Carter must go one step further. He must show that, provision having been made in the eternal scheme of things for the gratification of every legitimate appetite, provision has been made to gratify the thirst for adventure. In a quaint, fantastic and vivacious little play entitled The Squirrel's Cage, Tyrone Guthrie has demonstrated that each of us is like a squirrel shut up in a twirling prison. The very globe on which we live revolves continually. The year follows the same law: spring, summer, autumn, winter: the cycle goes round and round and round. A babe is born, a child develops, a youth matures, a man marries, a babe is born; and so the circle is again completed. Within this revolving cage it is natural that everything should tend towards monotony. All things go round and round and round! Now, if I had been writing Tyrone Guthrie's play, I should have pointed out that, just beside the whirling cage, there is a small box-like compartment in which the squirrel sleeps. The little creature's antics in the open may be wonderfully spectacular; but, to me, his dreams in the sleeping compartment are much more enticing. Curled up there, he dreams—dreams every night the same dream—a dream of felicities that might have been. It is a dream of the vast woods, the swaying tree-tops, the arching boughs that look like bridges specially constructed to make easy a squirrel's progress from one end of the forest to the other. It is a dream of rich clusters of tawny filberts, of the greensward littered with beechnuts, of oak trees twinkling with innumerable acorns, and of a wondrous abundance of sweet forest seeds. It is a dream of a cosy little nest, lined with fur and fibre and leaves and moss, high up in the fork of the fir tree; it is a dream of the sweetest, shyest, daintiest little squirrel that ever hid coyly behind the bole of an elm tree; and of four tiny wee squirrels, scarcely to be recognized as squirrels, nosing and jostling each other in the secrecy of the quiet nest. But when he gets to this part of his dream the sleeper wakes up with a quiver and a start, stretches himself, passes out into the revolving cage, and, partly in sheer desperation, partly to throw off the memory of his dream, and partly to make himself believe that he is racing madly about the forest, he twirls his treadmill like a thing bewitched. Lookers-on laugh when they see him doing it: but he himself is not laughing. He has come back to the monotony of his treadmill after his dream of a wonderful and romantic escape. 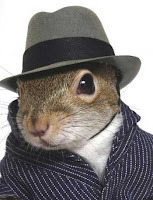 The whole point of Tyrone Guthrie's play is that, at least once in every squirrel's life, the cage door is left open. And everything depends upon his behaviour in that critical hour. Will he dare to pass out into the world to enjoy the actual realization of his dreams. Will his adventurous visions crystallize at last into actual experience? Or will he tremble in the presence of the unknown, and, terrified, creep back into his cage once more? That hour is the hour of his challenge; the greatest epoch in his life. Such a challenge comes, at some time and in some form, to each of us. We are presented with a sensational opportunity of escape. As a rule, when that sublime opportunity comes, we shrink from the unknown, hug the familiar cage, and allow the door to shut us in again. Tyrone Guthrie's hero, Henry Wilson, had the chance, in early youth, of going out to Africa. It appealed to all the adventurous instincts that tingled through his frame. But, on second thoughts, he felt that the exploit was extremely risky; his father pointed out the assured comforts that would accrue from his succeeding to the business; and so Henry, letting the cage-door close, went off to town every morning by the 9.23 and returned by the 6.13. Round and round and round! The Church's evangel presents people with the most sublime of all those challenges. In his Everlasting Man, Mr. Chesterton says that life is a great game of Noughts and Crosses. The Nought—the circle—represents the basic monotony of life. Like the squirrel's cage, it goes round and round and round. Oriental religions, Mr. Chesterton points out, became infected by the dreariness of this fundamental monotony. The most typical and most eloquent symbol on an Eastern temple is a serpent with its tail in its mouth—a complete circle—a round that ends where it begins—a grind, a routine, a treadmill. But beside the Nought, Mr. Chesterton says, stands the Cross. And, to play the game rightly, you must put the Cross inside the Nought. The four extremities of the Cross will pierce the Nought at four separate points, and, by the Cross, the monotony of life will be shattered into fragments and shattered for ever. He then presented it to the public gallery at Dusseldorf. And one day Count Zinzendorf was among the visitors who stood before it. Young, rich, gay and impressionable, the picture powerfully appealed to him, whilst the question beneath it rang through his soul like a challenge. It was a challenge, and he accepted it. He went out to serve his Saviour. He became the founder of Moravian Missions. Within a few months missionaries were sent to the Esquimaux and to the people of the West Indies. In a year or two, evangelists of the Cross were despatched to all parts of the world. The Moravian Brethren became, in 1738, the means of the conversion of John Wesley, and thus the amazing revival of the eighteenth century was initiated. The Cross had shattered the indolent monotony of Zinzendorf's life. He became a new man; the Church became a new Church; the world became a new world! The soul-stirring challenge had been accepted: the great escape had been made: and, as long as the world endures, people will rejoice in the sensational developments that followed. F W Boreham, ‘The Squirrel’s Dream’, A Witch’s Brewing (London: The Epworth Press, 1932), 89-99. Life has a wonderful way of tapering majestically to its climax. It narrows itself up towards its supremacies, like a mountain rising to its snow-capped summit in the skies. Our supreme interests assert themselves invincibly at the last. Our master passions are 'in at the death.' Let us glance at a pair of extraordinarily parallel illustrations. Paul is awaiting his last appearance before Nero. The old apostle is caught and caged at last. He is writing his very last letter. He expects, if spared, to spend the winter in a Roman dungeon. 'Do your very best,' he says to Timothy, ‘to come to me before winter.' 'And,' he adds, 'the cloak that I left at Troas with Carpus, when thou comest, bring with thee, and the books, but especially the parchments’! Under circumstances almost exactly similar Paul's great translator, William Tyndale, was lying in his damp cell at Vilvorde awaiting the fatal stroke which set his spirit free a few weeks later. And, as in Paul's case, winter was coming on. 'Bring me,' he writes, `a warmer cap, something to patch my leggings, a woollen shirt, and, above all, my Hebrew Bible'! Above all, my Hebrew Bible! The emphasis is upon the especially and upon the above all. Paul knows how isolated he will feel in his horrid cellar, and he twice begs his young comrade to hurry to his side. He knows how cold he will be, and he pleads for his cloak. He knows how lonely will be his incarceration, and he says, 'Bring the books'! Yet he feels that, after all, these do not represent the supremacies of life. It is not on these that he is prepared to make his final stand. 'But especially the parchments'! Much as he yearns for the clasp of Timothy's hand, he is prepared, if needs be, to face the stern future alone. Much as he longs for his warm tunic to shelter his aged limbs, he is prepared, if needs be, to sit and shiver the long winter through. Gladly as he would revel in his favourite authors, he is prepared, if needs be, to sit counting the links in his chain and the stones in the wall. But the parchments! These are life's supreme, essential, indispensable requisites. These represent life's irreducible minimum. 'Especially the parchments'! `Above all, my Hebrew Bible'! These are the supremacies of life. Sir William Robertson Nicoll has a story of an old Scotsman who lay a-dying. His little room was crowded with friends. Presently a number of them rose and quietly left. There remained his old wife, Jean, and the trusted companions of a long pilgrimage. As his frame became more feeble and his eye more dim one after another reverently rose, lifted the worn old latch silently, and left the room. At last the old man pressed the withered hand in which his own was clasped, and whispered faintly: 'They will a' gang: you will stay!' And at last he and she were the sole occupants of the little chamber. `Especially Jean.' Which things are an allegory. The pyramid narrows to its apex. Life contracts towards its supremacies. 'Especially the parchments'! 'I have hosts of friends,' wrote Lord Macaulay in one of his beautiful letters to his sister, 'but not more than half a dozen the news of whose death would spoil my breakfast.' And of that half-dozen he would probably at a later stage have made a selection. Friendship has its supremacies. The same is, of course, true of our libraries. Like the apostle, we are all fond of books; but our book-shelves dwindle in intensity as they grow in extensity. As life goes on we accumulate more and more volumes, but we set more and more store on a few selected classics of the soul. The number of those favourites diminishes as the hair bleaches. We have a score; a dozen; and at length three. And if the hair gets very white, we find the three too many by two. 'Especially the parchments'! Sir H. M. Stanley set out upon his great African exploration with quite a formidable library. One cannot march eighteen hours a day under an equatorial sun, and he gave a prudent thought to the long encampments, and armed himself with books. But books are often heavy—in a literal as well as in a literary sense. And one by one his native servants deserted him (the pyramid towering towards its apex). And, as a consequence, Stanley was compelled to leave one treasured set of volumes at this African village, and another at that, until at last he had but two books left—Shakespeare and the Bible. And we have no doubt that, had Africa been a still broader continent than it actually is, even Shakespeare would have been abandoned to gratify the curiosity of some astonished Hottentots or pigmies. It all comes back to that pathetic entry in Lockhart's diary at Abbotsford: 'He [Sir Walter Scott] then desired to be wheeled through his rooms in the bath-chair. We moved him leisurely for an hour or more up and down the hall and the great library. "I have seen much," he kept saying, "but nothing like my ain hoose—give me one turn more!" Next morning he desired to be drawn into the library and placed by the central window, that he might look down upon the Tweed. Here he expressed a wish that I should read to him. I asked, from what book. He said, "Need you ask? There is but one!" I chose the fourteenth chapter of St. John's Gospel.' He listened with mild devotion, and, when Lockhart had finished reading of the Father's house and the many mansions, he said, 'That is a great comfort!' The juxtaposition of phrases is arresting: `In the great library'—'there is but one book!' The pyramid stood squarely upon its solid foundation, but it towered grandly and tapered finely towards its narrow but majestic summit. 'Come,' says Paul the Aged, `for I am lonely; bring the cloak, for I am old and cold; bring the books, for my mind is hungry; but, oh, if all these fail, send the parchments!' Especially the parchments! Life's supremacies must always conquer and claim their own at the last. F W Boreham, ‘The Supremacies of Life’, The Luggage of Life (London: Charles H Kelly, 1913), 40-45.